Then we went to the Ogishi Craft Centre to see some of the hand-blown glass art there. Setsuko Ogishi herself was looking after the shop, and we chatted with her a bit about glass blowing and bought a small glass bowl. We did a wine tasting at De Iuliis winery and bought a couple of bottles of wine there. After things closed, we went to our accommodation at Shakey Tables and the Hunter Country Lodge. We’ve eaten at the restaurant here before and enjoyed it a lot, so this time we decided to stay on site, so we wouldn’t have to drive after eating dinner and drinking wine. 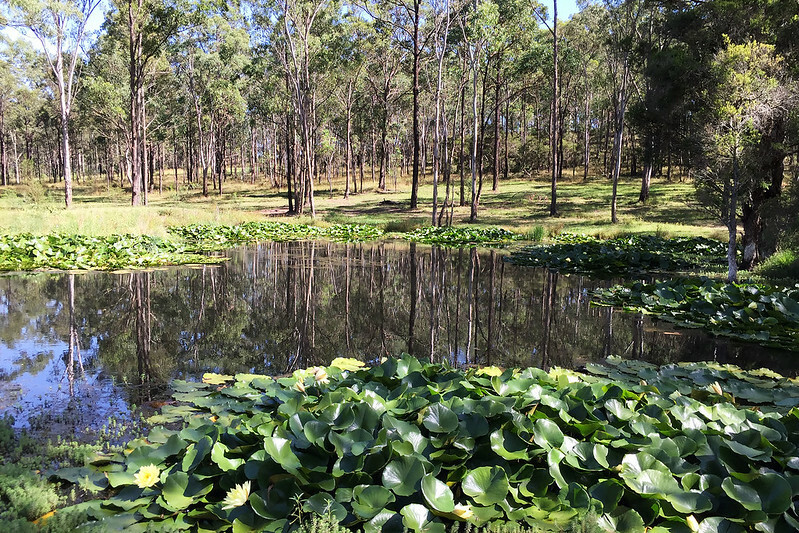 The site has its own vineyards, as well as a small pond backing onto some eucalyptus forest, and it very picturesque. The dinner was fantastic. 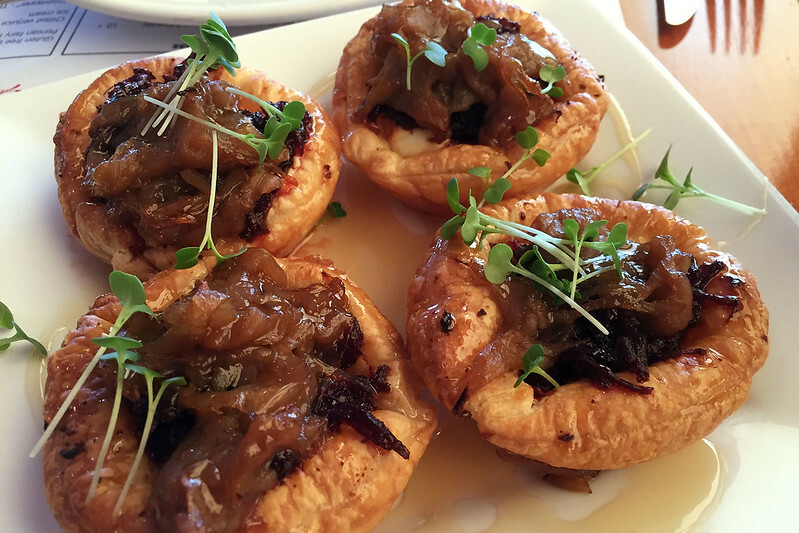 We split an entree of mushroom vol-au-vent with stuffed zucchini flower. Then I had the beef bourguignon pie with herb crusted bone marrow, while M. had potato dumplings with fried cauliflower and asparagus. For dessert I had a chocolate caramel bombe, and M. tried the cheese plate. We also had some glasses of their own wine, and M/ liked the rosé and the Pinot noir so much we bought bottles the next morning when checking out. After the continental breakfast though we took a brief stroll down to the pond and the grape vines. The day was already warming up and quite hot at 9:30 am. There were ripening grapes on the vines, turning from green to purple. 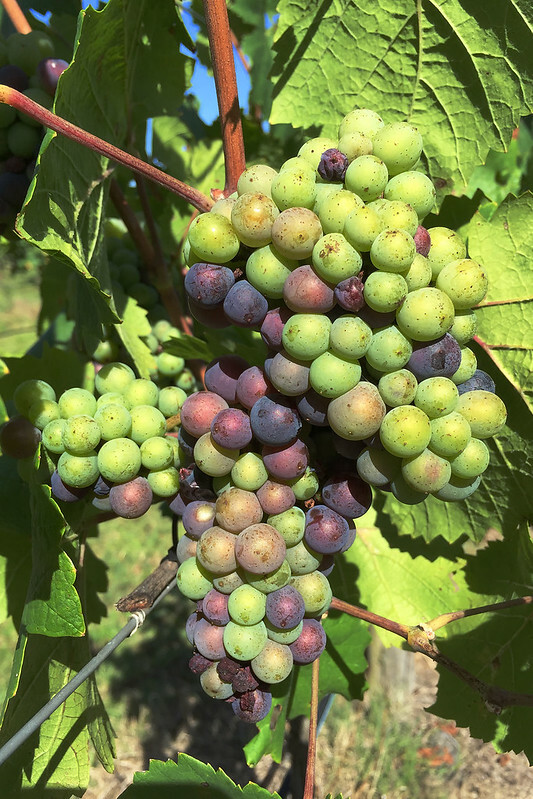 We had a chat with the owner and he said the grapes we were looking at were Pinot noir, and they didn’t grow much bigger than the size of a large pea – definitely not as big as table grapes for eating. He said the sugar content hadn’t started increasing yet, so they were still a few weeks away from harvesting. Walking across the field, we noticed tracks cutting across the grass, where something had obviously been walking a lot. When we got close, we realised the tracks through the grass had been made by ants! There were thousands of ants scurrying back and forth along the tracks, causing enough impact on the grass growth to make obvious bare dirt tracks! After checking out we went to the Matilda Bay Brewhouse (previously the Bluetongue Brewery) to pick up some bottles of locally made beer. There was also a dessert cafe there, and some of the things looked marvellous, so we sat and had a morning tea of chocolate cups – mine with salted peanuts, and M’s with caramel. Across the road was the Binnorie Dairy cheese shop. We tasted some marinated goat’s feta, and some other cheeses. It was a very hot day, and the lady said many of the cheeses wouldn’t do well in a hot car all day without being in a cooler with ice, but the marinated feta would be okay as it was stored in oil. We bought a small cooler bag and a jar of the feta to take home. Next we went to Butterflies Gallery to look at some of the artwork. And then to Oakvale Winery right next door, which had a sign out the front advertising apple and pear ciders. After tasting both ciders and also some of the wines, we bought a couple of bottles of the pear cider. The next stop was the Hunter Distillery, where we sampled some of the spirits, including gin, blackberry schnapps, mango liqueur, and (for M.) coffee liqueur. Rather than give you small wine glasses to taste from, the samples here came in test tubes! By now we were hungry for lunch, so we went to the Hunter Valley Cheese Company, where we did a cheese tasting, and then ordered a cheese platter for lunch. We selected the brie, cheddar, and an aged goat’s cheese from their range, and it came with crackers, baguette slices, and fruit paste. 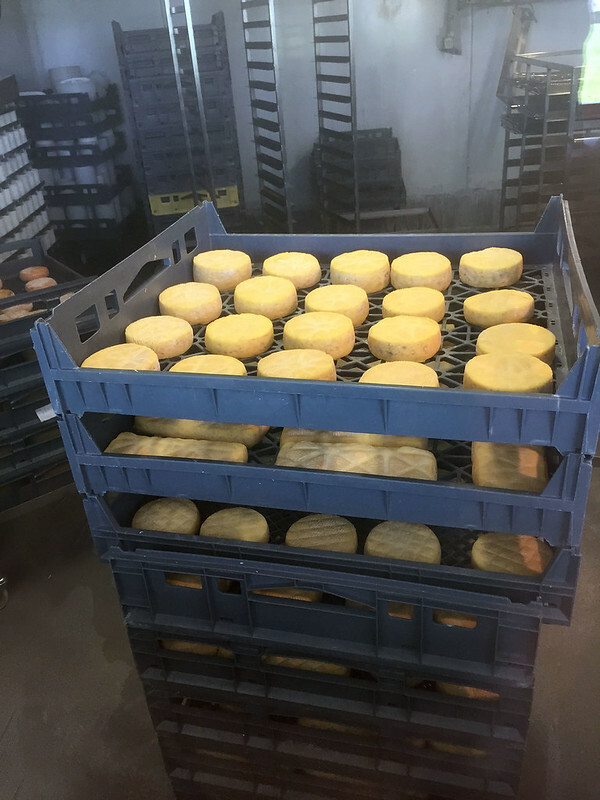 It made a nice lunch, sitting in the shade of the veranda outside the cheese factory display rooms where we could see washed rind cheeses maturing inside the refrigerated room. Our last stop was McLeish Estate winery, where we have been many times (as we know the nephew of the owner). This winery was awarded many major prizes for its 2007 Semillon, including first prize in the London International wine show, marking it as one of the best wines in the world. I said I wanted to buy a bottle, and the woman behind the counter offered a taste from an opened bottle (normally they don’t offer free tastings of this vintage). 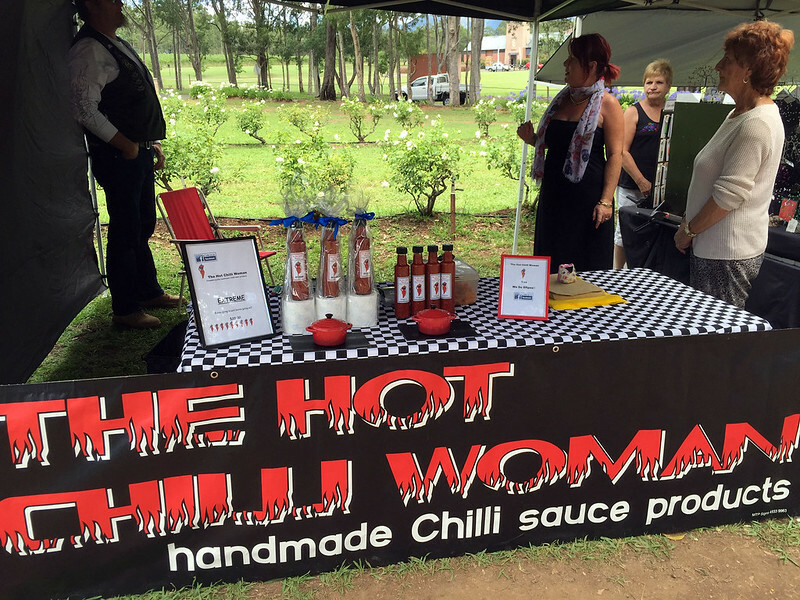 I tried it and my immediate reaction as the wine hit my tongue was “Oh my goodness!” It was truly amazing – crisp and sharp with citrusy flavours and lots of other wonderful things all happening at once – truly a bright and happy party in the mouth. I’ve only had this immediate “Oh wow!” reaction to a wine two or three times before (one was tasting the Art Series Chardonnay from Leeuwin Estate in Western Australia – another one I remember vividly). Anyway, a bottle of this wine is expensive, but I don’t regret buying it for a second. We also bought a few other bottles of various wines here, loaded up the car, then began the drive home. We stopped briefly in Wollombi to get a coffee for M. While waiting for it, I got some gelato from the general store – mango and pomegranate flavours, which were really good in the very hot heat of the day. We drove straight home from there, getting in about 5pm. This entry was posted on Wednesday, 31 December, 2014 at 13:32	and is filed under Diary, Travel, Wine. You can follow any responses to this entry through the RSS 2.0 feed. You can skip to the end and leave a response. Pinging is currently not allowed.